"I have been making this for a number of years, and everyone who has tried my ribs, chops and chicken says it has the best they ever had. Maybe they were just sucking up for a free meal, but I think it's good!" Stir together white sugar, brown sugar, paprika, black pepper, garlic powder, salt, chili powder, and cayenne pepper until blended. Store in an airtight container until ready to use. To use the rub, remove the membrane on the back of the ribs, and rub both sides of the ribs with the mixture. Don't skimp on the rub! Wrap the ribs with plastic, and refrigerate overnight. 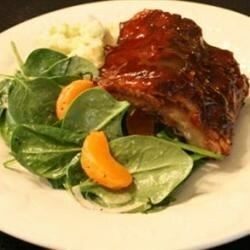 Cook the ribs slowly over indirect heat for 2 hours, basting with your favorite barbeque sauce during the last 20 minutes. i used regular table salt and this is WAY too salty. I would reduce the salt by 75%. (was this supposed to be kosher salt?) Otherwise, the spice combo was good. I originally thought there was too much sugar, but the ribs came out great! I will make a double recipe next time to keep on hand in an air tight container. I cut the sugar down to 1/2 C white sugar and 1/2 C brown sugar to make it a bit healthier. The ribs were fantastic!